In the Insert Merge Field dialog box, you can insert information from individual fields, such as first name, telephone number, or the amount of a contribution from a list of donors. To quickly add a field from your data file to the main document, on the Mailings tab, in the Write & Insert Fields group, click the arrow next to Insert Merge Field, and then click the field name. For more options, click Insert Merge Field to open the Insert Merge Field dialog box. To select address fields that will automatically correspond to fields in your data source, even if the data source's fields don't have the same name as your fields, click Address Fields. 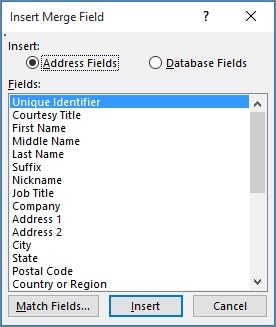 To select fields that always take data directly from a column in your data file, click Database Fields. To add merge fields to your document, in the Fields box, click the field you want, and then click Insert. Repeat for each field you want to add, and then click Close. If the Match Fields dialog box appears, Microsoft Word may have been unable to find some of the information it needs to insert the field. Click the arrow next to (not matched), and then select the field from your data source that corresponds to the field that is required for the mail merge. Note: If you insert a field from the Database Fields list and then later switch to a data source that doesn't have a column with the same name, Word won't be able to insert that field information into the merged document.